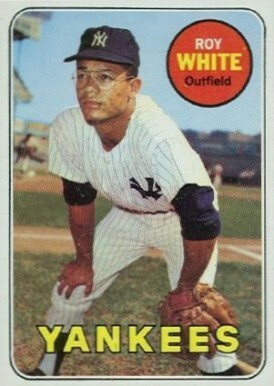 “Rippin Roy” was one of the few bright lights in the dreadful Yankee lineups of the late sixties. In eighteen years with New York, this speedy, switch-hitting outfielder appeared in almost 1,900 Yankee games, smacking over 1,800 career hits. I will never forget White’s performance during the 1970 season. The previous year, the Yankees had finished next-to-last in their division during the inaugural season of Major League Baseball’s switch to divisional play. With Roy leading the way with 180 hits, 109 runs scored, and 94 runs batted in, the 1970 club won 93 games, finishing second to a very strong Oriole team. That was the same year Thurman Munson earned the AL Rookie of the Year award. When Bobby Murcer broke out as an offensive force the following season, my beloved Yankees became fun-to-watch again, ending the nightmare performances of the late sixties. It was a special treat for Yankee fans to see Roy play well enough long enough to take part in the Pennant and World Series winning Yankee teams of the late seventies. Roy was born in Los Angeles and turns 68-years-old today. This former Yankee catcher and DH and this current Yankee reliever were also born on December 27th.